Have you tried Micellar water yet? I am such a fan! I have been using Micellar water for years...even when it was hard to find in the USA and I had to buy it online and ship it. Well, times have changed and now even the local drugstores carry Micellar water! Micellar water is a formula of triple purified water and cleansing oil molecules called “micelles” (tiny balls of cleansing oil mollecules). So, the micelles are attracted to dirt and oil. So, they are able to draw out impurities without drying out the skin. Micellar water is a true 3-in-1 cleansing product: micellar water can be used as a facial wash, makeup remover, and moisturizer all in one. While the product looks like water, if you feel it, it's consistancy is a little bit different. While Micellar water has many uses, I primarily use it as a makeup remover or the first step in my cleansing process. I do not wear very heavy makeup, at all. My makeup looks very natural and light. So, most days, Micellar water is all I need to remove my makeup when combined with a 2-step cleansing system of Micellar water followed with a regular face washing. So, for this use, the Micellar water is very effective and removes everything when combined with face washing. Another way that I use Micellar Water is for a quick sink-less cleanse. In the morning, if I do not shower (which is rare, but there are days that I wake up and go for a run or exercise right away). In those cases, I just swipe some Micellar Water all over my skin with a cotton round. This completely removes any product residue or dirt and oil from overnight. -decant a small amount of Simple Micellar Cleansing Water onto a cotton round. -Press the cotton round over my eye to dissolve makeup. Note: if you wear heavy makeup, Micellar water alone might not take off stubborn long wearing foundation nor waterproof eye makeup. 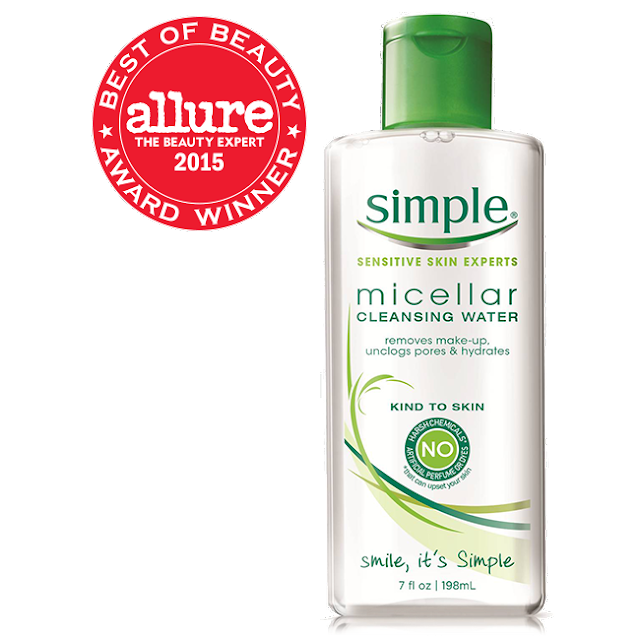 Simple's Micellar Cleansing Water was designed to gently and effectively cleanse skin while also leaving your skin feeling hydrated. According to Simple, it hydrates skin by 90%. All skin types can use this Micellar water, even sensitive skin (like mine!). In addition to triple-purified water, Simple Micellar Cleansing water also contains Pro-Vitamin B3, and Vitamin C.
To use, I just swipe it on with a cotton round (no rinsing needed). 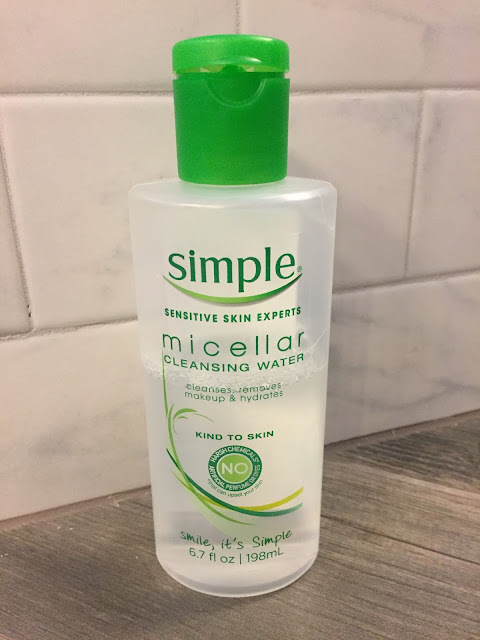 I really enjoy using this Simple Micellar Cleansing Water as part of my everyday cleansing routine. It is so...simple (lol) and effective. It leaves my skin feeling fresh and I love that it removes my light makeup so effectively with no residue. I love Simple Micellar Water. It's fantastic and a daily part of my cleansing routine.